Where: Park your auto/bike/horse at the Fort Worden USO Building Lot, just west of the Taps at the Guardhouse Pub (old Information Center). 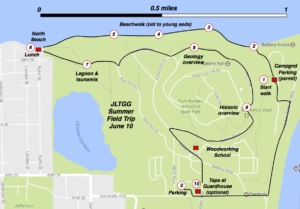 What: Geology of Fort Worden, plus some history of the old fort and the State Park. 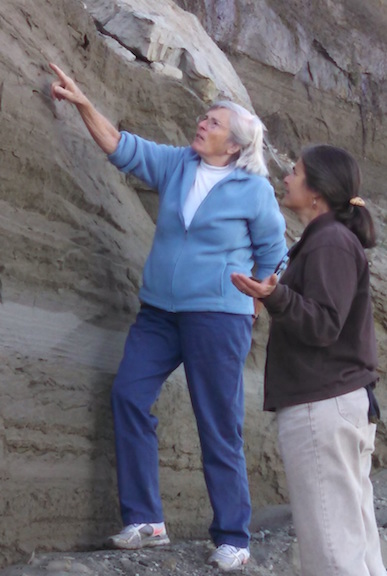 We’ll concentrate on the glacial sediments on the north-facing bluff but will also discuss marine landforms, erosion, drift cells, possible faulting, and tsunamis. After the walk (about 3 miles), there is an option to have beverages at the Taps at the Guardhouse Pub. Bring a pack, lunch, boots, and water (camera, binoculars); dress appropriately for the weather. How: Will accept registration postmarked after May 22nd. You must send your registration form and a check made out to Jefferson Land Trust for $10 per person to Leslie Aickin. No more than 2 persons per registration. No dogs or children under 16 yrs old. We’ll accept the first 25 persons to register and have a short standby list (hence the need for contact information).